This year we became a miniature “Christmas Village” family. I’m not gonna lie, we were all pretty enchanted by the process of gathering, setting up and displaying our magical little town this Chirstmas. It made us all ridiculously happy. Perhaps it’s needless to say, but the village was the last of the decor to get packed up and put away (just a few days ago). 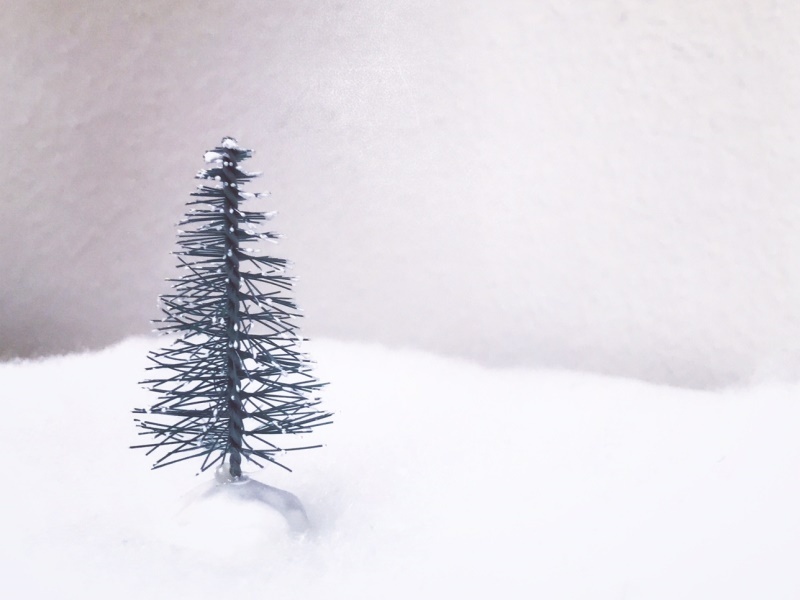 As I carefully disassembled our very own St. Nicolas Square, one tiny tree standing alone at the top of a cotton snow hill caught my attention. Totally enraptured by it’s miniature charm (what is it about tiny things?) I grabbed my iPhone. Which led to my DSLR. And my favorite lens. Then some white foam core. And a flashlight… (you get the picture). Before I knew it I had been playing for an hour. I cannot begin to describe how much fun I had; me, the tiny trees & a small blanket of faux snow. And of course, my creative medium of choice, my camera(s). The concept of getting carried away in creative play isn’t new to me. I know that carving out time to allow for photo fun (or any kind of fun for that matter) is important but on this particular January morning, I hadn’t set out to play, which might be the reason is was so much fun. It was totally unexpected and because I let myself get totally lost in the process, I spent an hour of my day on something that made me totally happy. Even more, not only did I have a blast creating a tiny photo shoot but I am captivated by the images that came from my tiny photo shoot. The whole escapade started off with the top photo of this post. And then I really got into it! The six other shots are my favorites from my iPhone. I edited them with either Instagram or Lightroom app. I haven’t even looked at the one’s I shot from my DSLR. If there’s anything noteworthy there, I’ll be sure to share. If nothing else, my tiny tree project reminded me that good things come when I follow my creative whims and let myself play. And that goes for you too. More play in 2018! Who’s with me? Love this! It is so easy to get caught up in creativity and play, and good for us too! Lost in the process..that’s what it’s all about! It is such a wonderful thing to be able to get lost in what we love.